If you've been to Stroud and seen a large, talkative woman dressed in purple, it's likely to have been me. I've always had plenty to say and that's at the core of my work as an artist. Wrapped up in each piece of work I make, is something I'm passionate about. I've always had an affinity for the colours and textures of fabrics and threads and I've always loved the natural world so I've been putting the two together for more than forty years. 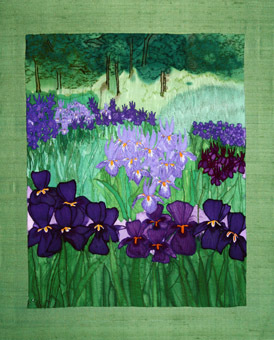 When I started working as a textile artist, painting fabrics, padding and stitching naturally lent themselves to framed pictures of landscapes and flowers. 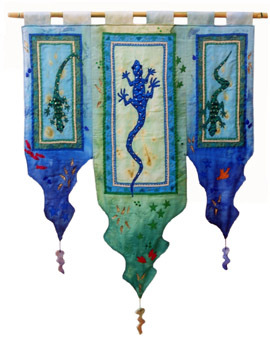 A desire for brighter colours and more sparkle led to painted and stitched mirror frames and eventually in the late nineties I began making silk wallhangings. 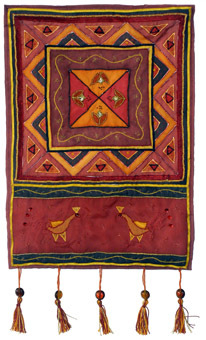 Alongside the hangings I now also make silk "canvasses", where silk painting and machine embroidery mounted on silk dupion over a frame are the main techniques used. As well as animals, I now find myself returning to my original themes of landscape and flowers with a taste of English gardens or the French countryside, where colour is, as it always has been, the way I capture the spirit of my subject. 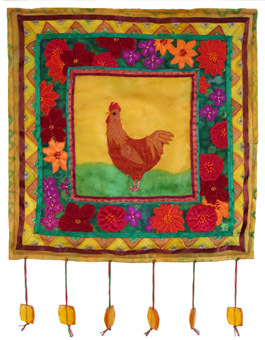 Again, the themes are landscape and flowers and like my early textiles work, framed. This time I use my original photgraphs to print onto silk and use machine stitching to enhance some areas. Further areas of the photograph are printed onto paper which is attached to the mount and the whole thing framed without glass. In addition to decorative textiles, since 2012 I have returned to my college roots and the world of fashion, making painted silk scarves and co-ordinating accessories. I paint the scarves in a variety of designs, some one-off but for some I return to popular designs, though each scarf is unique. 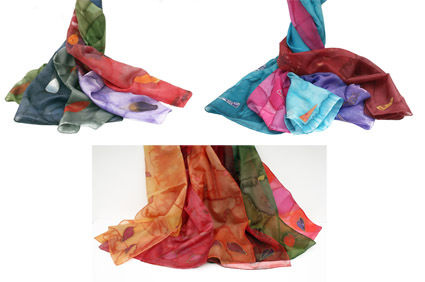 Scarves may be ordered in colours (or designs) of your choice. Most of the scarves are 45cms x 180cms; prices vary according to fabric (silk chiffon, pongé or crêpe de chine) and design and start at £24. 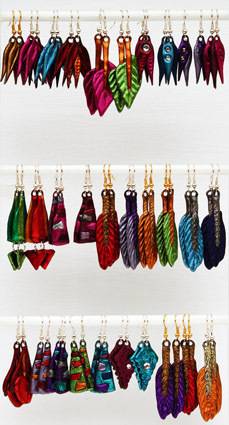 Several of the scarf designs have inspired co-ordinating earrings in bright colours though many accessories are made and bought as entirely separate items. Many of my hangings and canvasses are reproduced as photographic greetings cards. 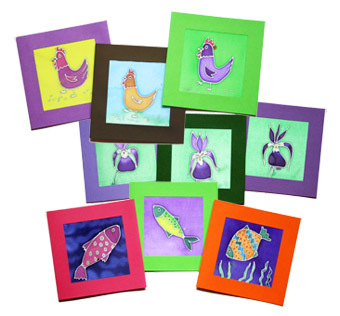 I also make several ranges of silk-painted cards where I can indulge in a little frivolity and humour, painting birds with wacky hairstyles and cats and pigs in greens and purples. As well as the square cards shown here I make a range of cards for various ages and anniversaries. The image on the front of my fridge magnet cards peels off so it can be enjoyed on fridges & filing cabinets after the special event. Fridge magnet cards come as wallhanging photos, photos of natural subjects and romantic Valentine or "I love you" versions. I am always happy to work to commission to make something for a special occasion, a particular setting or an image of your favourite subject. I now work full-time as an artist but use my thirty years' teaching experience in occasional workshops where I really enjoy the enthusiasm of the students for the materials and techniques that I love. 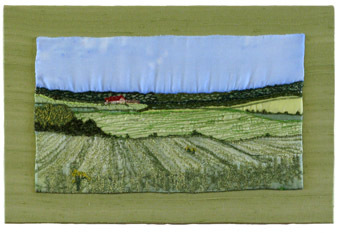 More information about workshops as well as images and information about my textiles work can be found on my website. 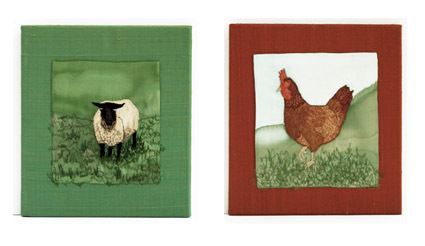 Prices dependent on sizes, starting at about 14cms square. Working within your budget is often a part of the planning for commissions. 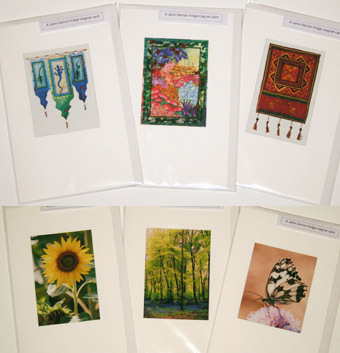 Greetings cards from £1.00 to £4.25.